"Teaching history and geography together can be very beneficial to our students," said Luz Angela Rocha, a professor in the cadastre and geodesy engineering program at the Universidad Distrital Francisco José de Caldas in Bogotá. "It provides the students with the geographic context of where events happened, which may have had an influence on why a particular event happened. However, too often, our social studies teachers have strong educational backgrounds in history and a limited knowledge of geography, so they naturally emphasize history in their classes." For the past several years, members of the program's core spatial data research group (known by its Spanish acronym NIDE) have developed introductory GIS tools and courses for social science teachers. But because teachers are generally unable to attend full-time courses in a classroom setting, this approach has seen limited success. So Rocha began thinking about creating a web GIS course to attract a wider audience. A few years ago, three of Rocha's graduate students—Diego Fernando Enciso López, Laura María Hernández, and José Luis Romero Ariza—approached her to discuss possible capstone projects. 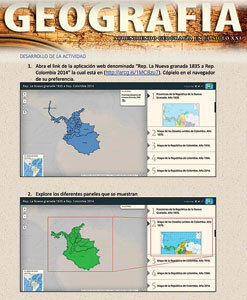 They decided to use ArcGIS Online to develop an introductory GIS course for secondary school social studies teachers. Rocha agreed to direct the project, which ended up being called Learning Geography in the XXI Century. Key to the project was creating a course that met the standards established by the country's Ministry of Education. For its online resources, the Ministry uses Moodle, an open-source learning management system, as the platform for Colombia Aprende, the country's education portal for primary and secondary school teachers. 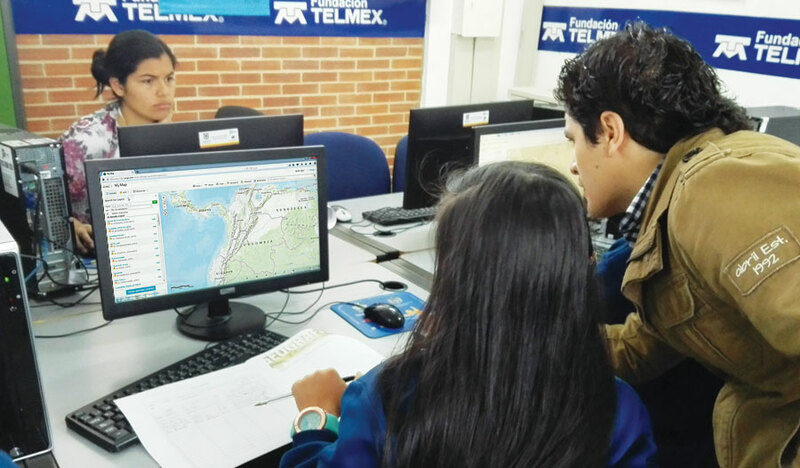 "While there are exceptions, there is generally a limited knowledge and understanding of GIS by the teachers in our schools," said Sabrina González Toro, the education industry leader for Esri Colombia. "Also, many schools lack the technological resources to offer a program of this sort. This makes the efforts of professor Rocha and her team—and those educational initiatives provided by Esri Colombia—of particular importance in the introduction of GIS technology to the secondary school students in our country." Lida Buitrago from Lorencita Villegas School in Bogotá said, "It's a different way to deepen our knowledge of history and geography, particularly in preparation for our standardized national tests." 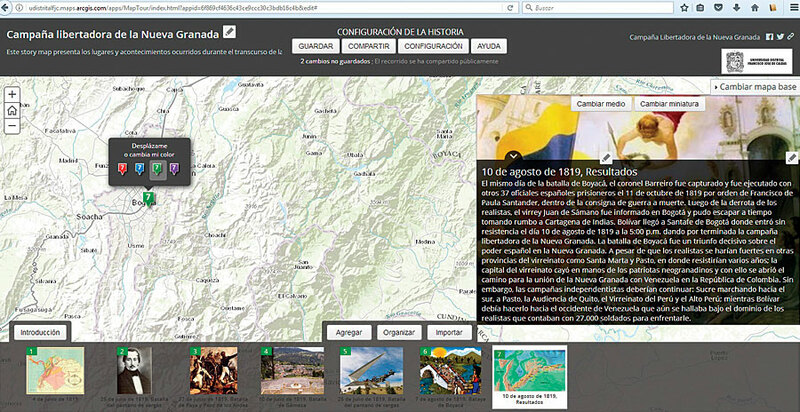 Paula Hurtado, also from Lorencita Villegas School, added, "It is an easy tool to use and interact with the topics." Laura Tatiana Rincón from the Garcés Navas School in Bogotá said, "It's a different way to learn, and it would be cool if we could use this method in our social studies classes." And Martha Isabel Leguizamon, a social studies teacher at the Garcés Navas School, noted, "I think this is a very good tool because students today are constantly using computers and are familiar with studying this way. It allows them to explore things in more depth to gain a better understanding of the materials and provides them with the opportunity to work with the tools and systems they will use in the future." "Social studies is a regular part of our curriculum starting in the first grade," said Lesbia María Charris, a social studies instructor at the Colegio La Enseñanza, a Catholic school for girls in Barranquilla. "In their various classes, students study world history; ancient history; and, of course, the history of Colombia. The related geography is also taught in these courses. I have had the opportunity to review some of the exercises in Learning Geography in the XXI Century, and I think the concept of using GIS as a method to engage students in history and geography lessons is very interesting." "Our strategy is to continue to improve Learning Geography in the XXI Century and offer it through the Colombia Aprende portal," explained Rocha. "We encourage the graduates of this course to try implementing ArcGIS Online in their own social studies classes." "There are difficulties to overcome," concluded Rocha. "But I do believe that we are on the right path to introduce GIS to our social studies teachers and their students."